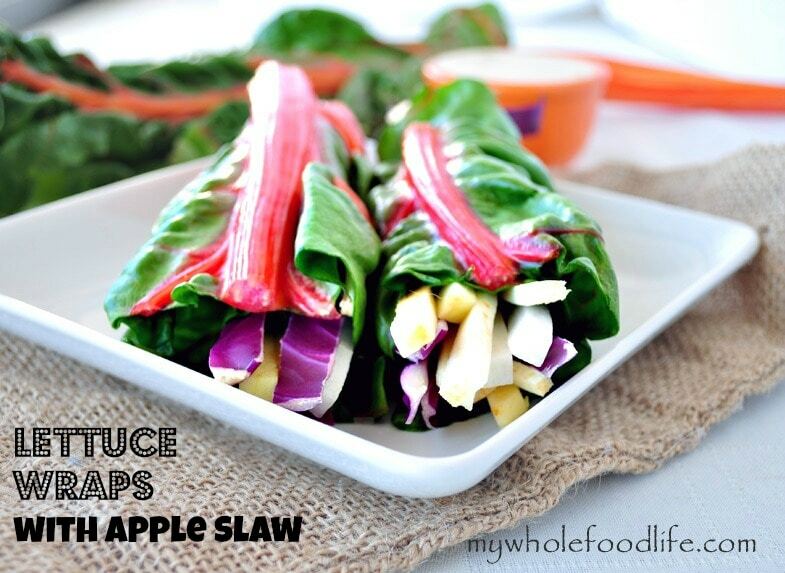 Chard Wraps with Apple Slaw. The other day my husband bought a bag of apples because they were on sale. It was perfect because I have been wanting to do an apple slaw. I normally make a crock pot applesauce. What better way to enjoy the apple slaw than a in a chard wrap? These lettuce wraps with apple slaw are the perfect healthy dish to kick off the new year with. The tahini dressing really makes this apple slaw stand out. In fact, I use it as a dressing for salads as well. I love lettuce wraps because they fit into every diet. Gluten free, grain free, vegan and raw. A simple, healthy and low carb meal that you will love! In a bowl, add the orange juice with the other ingredients and stir until mixed well. Add the slaw ingredients in a bowl with as much of the sauce as you like and mix well. Cut the chard leaf into three pieces perpendicular to the spine. One piece is enough to use as the wrap. Lay the section of the chard leaf flat. Add the slaw to the leaf. Wrap the ingredients in the chard leaf. Serve with more dressing to dip. NOTE: If you don't want to julienne the vegetables, you can probably shred them as well. Don't have parsnip laying around? Use carrots instead. In fact, the next day, we just used our left overs and threw everything into a salad bowl and ate it that way. This recipe is very versatile. Enjoy! This recipe contains no saturated fat. The fat in sesame seeds is largely the unsaturated kind. You need saturated fats (coconut oil, grass-fed tallow, pastured lard, ghee, grass-fed butter, etc.) to absorb any nutrients. While this would be a healthy meal, you're just going to pee all those lovely nutrients right out. I'm sure you could add coconut oil to the dressing if you wanted. So? Lots of recipes don't. You can always have something else on the side like some nuts or some dark chocolate for desert. Problem solved! I was thinking the same thing Amy. While I was at the gym, I was thinking about this. What about juicing? Juicing lets you absorb the nutrients immediately and you are not juicing saturated fats. I would love to see an article baking your statement up Carrie. Can you possibly provide one? I am honestly curious. Please show me an article. Not another blog post. The lettuce wraps look delish. I too am confused about fat pairing. I recentl read this article: http://www.sciencedaily.com/releases/2012/06/120619230234.htm about fats and nutrient absorption. However, I'm wondering like the above poster if you add nuts if that would be sufficient? Thanks for sharing the article. You can most certainly add nuts. I almost did add slivered almonds to this. I also had a reader make these and she added almonds and toasted coconut. She said it was delicious that way. I love this idea and have been looking for a new way of eat my salad. I usually make a similar dressing of oranges, garlic, ginger and sriracha but I never thought to use it as a sauce. Thanks for the inspiration! You are so welcome! I hope you enjoy the recipe!